The opening track sets the scene for the remainder of the album to follow with songs such as Calling From The Core, The Coldest Night, Blood Vortex and Architect Of Despair. 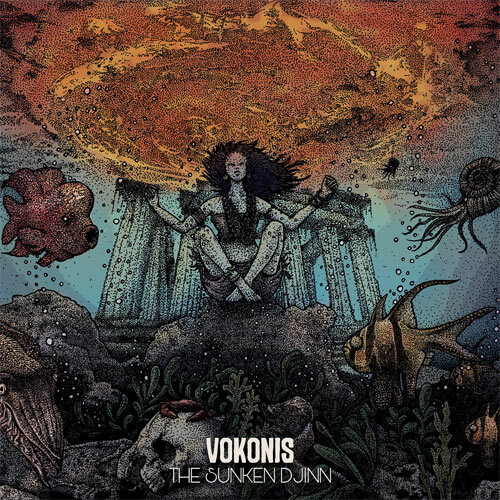 The songs run between the four minute to six minute mark and this allows Vokonis to explore and experiment more with their more progressive sounds. Especially with the albums psychedelic sounds as it adds a more world weary feel to the album. The production is handled superbly well and that is what you expect from a Ripple Records release. When have those guys ever released a bad sounding record. I can’t think of any. The Sunken Djinn is a doom metal album in every sense of the term and this is an album that will no doubt send Vokonis onto greater things. Vokonis take influence from their musical heroes and you can hear familiar sounds but Vokonis still manage to create their own sound. The band becomes permanent doom dwellers with the music nightmarish in scope. Sue the last song – Maelstrom – embraces a less enjoyable dronish aspect but that doesn’t stop Vokonis becoming one of the best upcoming bands within the Doom Metal world. High praise. Maybe, but Vokonis have delivered the goods with this album. Fans of Black Sabbath, High On Fire and Mastodon will find much to admire and riff-worship here.